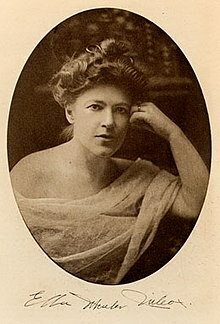 Ella Wheeler Wilcox (November 5, 1850 – October 30, 1919) was an American author and poet. Her best-known work wasPoems of Passion. Her most enduring work was “Solitude”, which contains the lines: “Laugh, and the world laughs with you; Weep, and you weep alone”. Her autobiography, The Worlds and I, was published in 1918, a year before her death.